Director – Michel Gondry, Screenplay – Charlie Kaufman, Story – Michel Gondry, Charlie Kaufman & Pierre Bismuth, Producers – Marty Bergman & Steve Golin, Photography – Ellen Kuras, Music – Jon Brion, Visual Effects – Buzz Image Group (Supervisor – Louis Morin), Special Effects Supervisor – Drew Jiritano, Production Design – Dan Leigh. Production Company – Anonymous Content/This Is That. Following the break-up with his girlfriend Clementine Kruczynski, Joel Barish is upset to learn that she has gone to the Lacuna Institute to have her memory of him erased. Joel goes to the Institute and decides to sign up to have his memory of her erased. As the Lacuna technicians set up in his apartment and start to erase all memories of her while he sleeps, Joel is able to hear the conversation going on in the apartment outside his head and learns that one of the technicians Patrick has gone into Clementine’s file, found her memories of him and is now wooing her. As the memories begin to be erased, Joel decides that he does not want to lose memory of Clementine after all and tries to fight against the erasure. Inside his mind, he conspires with Clementine to hide inside his buried memories in the hope that he can save some part of her. Charlie Kaufman has developed a reputation as one of the most watchable and brilliant, perhaps even cultish screenwriters, to emerge in the last few years. Kaufman first appeared with the hilarious Being John Malkovich (1999) for director Spike Jonze, which was one of the most off the wall comedies of its year. From there Kaufman went onto George Clooney’s greatly underrated directorial debut Confessions of a Dangerous Mind (2002), adapted from the supposedly true biography of tv host Chuck Barris, and then reteamed with Jonze for Adaptation. (2002), which started out as a straightforward adaptation of Susan Orlean’s non-fiction book The Orchid Thief (1998) only to be metamorphosed by Kaufman into a uniquely brilliant meta-fiction on the problems of writer’s block experienced in adapting the novel with Nicolas Cage playing both Kaufman and his fictitious twin brother alter ego. Subsequently, Charlie Kaufman made his directorial debut with Synecdoche, New York (2008), an amazing meta-fiction about a theatre director whose life is overtaken by the play he is staging, followed by the stop-motion animated Amonalisa (2015). With Eternal Sunshine of the Spotless Mind, Kaufman teams up with French video director Michel Gondry for whom he had previously written Human Nature (2001), the only flop among Kaufman’s scripts, a farce on civilization and primate behaviour. With a story such as this, where a protagonist undergoes memory wipe before discovering that he really loves the girl that he is attempting to eliminate, another director and writer would almost certainly have turned it into a maudlin love story. However, for Charlie Kaufman this is merely a springboard for one of the most astonishing science-fiction films of recent years. Kaufman spins the premise through a number of ingenious and remarkably adept turns. 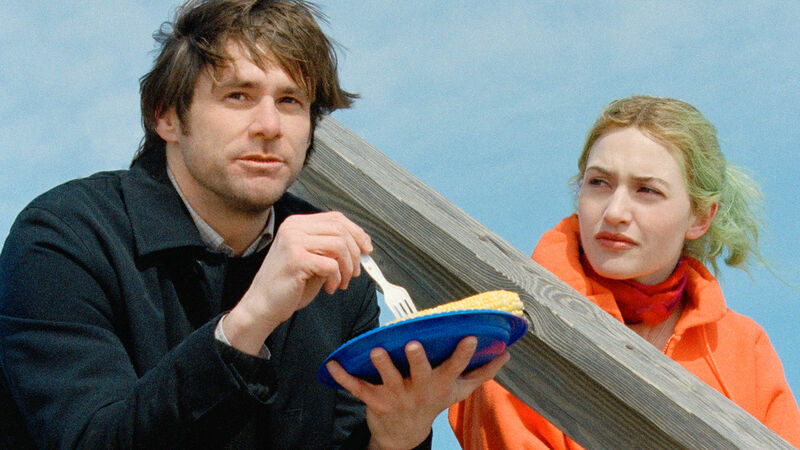 There is an extended opening that goes on for some fifteen minutes before the credits showing Jim Carrey and Kate Winslet meeting on a Montauk beach. As the film progresses, this proves to be a deceptive opening, the full meaning of which is not apparent until the ending. Things become puzzling as we then see some aspects of the opening being replayed with Elijah Wood taking on Jim Carrey’s role and then a completely different story of how the two met being given as Carrey’s memories are erased. The ending when it does arrive is extraordinary and beautiful. (Although, one kept wondering if the memory of Kate Winslet’s character left buried clues inside Jim Carrey’s mind before she was erased, how she managed to obtain the self-same clues herself – after all it is only his memory of her leaving the clues, surely not some shared telepathy). Equally so the script is constantly twisting and Charlie Kaufman writes out a brilliant series of turns around all of the side characters – Elijah Wood’s horny geek and his attempts to seduce Kate Winslet; and the relationship between Mark Ruffalo and Kirsten Dunst, which suddenly blossoms out to take on another dimension in an extraordinary mid-story spin, not to mention a beautifully ironic twist at the ending. 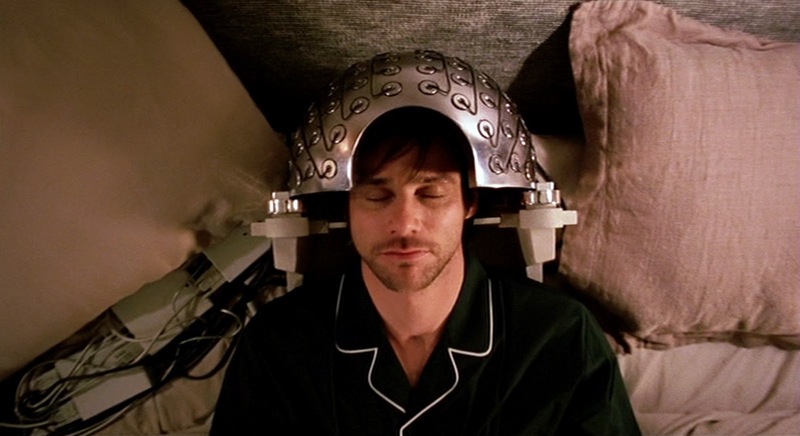 Charlie Kaufman’s scripts are also notable for their whacky off-the-wall humour, which becomes especially hilarious here when he has Jim Carrey and Kate Winslet trying to hide from erasure in his buried memories as a baby or during guilty memories of him being found masturbating by his mother. Kaufman writes another of his self-excoriating lead characters in Jim Carrey’s Joel Barish. Joel is surely another facet of the self-loathing, emotionally bound Charlie Kaufman that Kaufman gave us in Adaptation and, as before, one who is perpetually seeking the right woman to come and deliver him from self-absorption. At least the character’s negative and even unlikeable screen presence is well suited to Jim Carrey in the wet-eared serious acting mode he has been struggling to perfect in recent years away from his over-the-top comedy antics that have made him a box-office name. Equally remarkable is the dexterity of Michel Gondry’s direction. 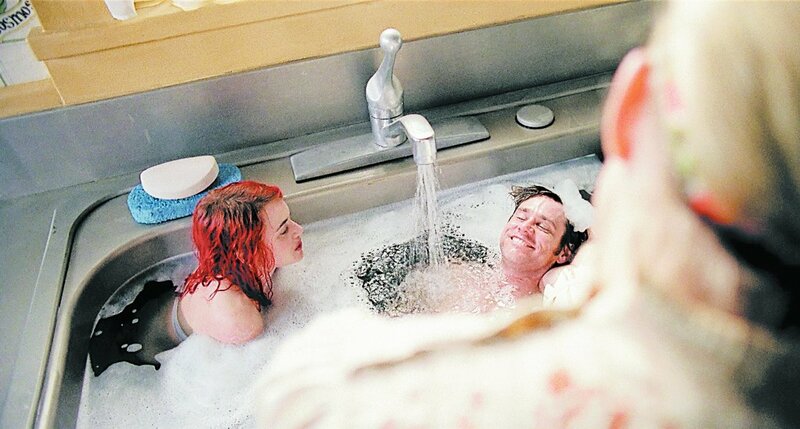 (Eternal Sunshine of the Spotless Mind was the film that helped Michel Gondry move from a cult video director to being appreciated by a wider audience). Gondry chooses some quite surreal means of depicting Jim Carrey’s memory erasure – the slow elimination of detail on shopfronts along the street, fences vanishing slat by slat as characters flee and cars being stripped to their innards, vehicles nonchalantly crashing down in the street as Carrey and Kate Winslet have conversations, bookshops where the titles of books on shelves slowly metamorphose to grey, people’s faces blurring out. It is a film that certainly assumes a fair degree of intelligence of its audience – one suspects the popcorn and Coke canaille of moviegoing audiences would have trouble keeping up with some of the places that the film takes one, from Charlie Kaufman and Michel Gondry having characters talk directly to other characters who exist within their memories, the story taking place out of narrative synch, not to mention the replayings of events with subtle variations and the wilfully misleading opening section. Michel Gondry gets fine performances from his entire supporting cast. Kate Winslet shines with the effervescent, bubbling delights she usually brings a role, while Tom Wilkinson brings customary dignity and Elijah Wood wittily shakes typecasting in a role at 180 degrees remove from Lord of the Rings stardom. The most about-face turn is the performance from Mark Ruffalo. The role here of a bespectacled computer geek is at almost completely opposed remove from the last part that one saw Ruffalo in – as the sexily macho cop in Jane Campion’s In the Cut (2003). Ruffalo is almost unrecognisable, not to mention looks something like fifteen years younger – in his early 20s, as opposed to In the Cut where he happily played alongside a mid-40s Meg Ryan. (Ruffalo is in actuality 38). Although the most subtly effective performance in the film comes from Kirsten Dunst, who is cast as a secondary character, which she plays with subtlety, and whose character twist ends up becoming one of the most heart-rendering parts about the film. Director Michel Gondry next went onto make the delightfully offbeat The Science of Sleep (2006) about the bizarre dreamlife of a man; Be Kind Rewind (2008), a comedy about making copies of amateur films; the masked superhero film The Green Hornet (2011); the charmingly surrealistic romantic whimsy Mood Indigo (2013); and the non-genre Microbe and Gasoline (2015) about two young inventors on an adventure. (Winner in this site’s Top 10 Films of 2004 list. Winner for Best Original Screenplay and Best Supporting Actress (Kirsten Dunst) at this site’s Best of 2004 Awards).